As I have said, I will be putting some video footage of the LMS walking pilgrimage to Walsingham up in the days ahead but it will take time as it takes a seriously infuriating time to upload videos on my computer. 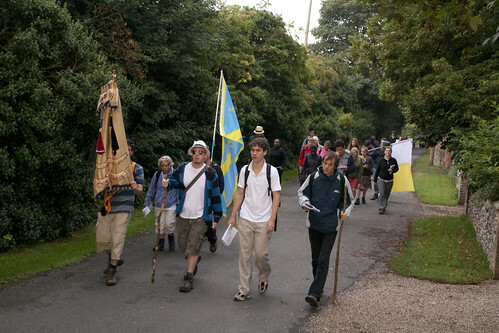 On the third walking day we rose again, at 5am, in order to pack away out tents and head on to our destination of Walsingham. I know that we sang prayers for the dead at a ruined abbey somewhere, but I don't recall where and when that took place. Check out the Juventutem blog and Dr Joseph Shaw's blog for more details of the pilgrimage and some cracking pictures. By Day 3 (in the Big Mother House) the old legs were getting used to it but we only had to walk for half of the day before we reached the rebuilt and re-sited Holy House of Nazareth, Walsingham, where I prayed for mercy for myself, for personal intentions and lit a candle for your intentions in the Holy Ghost Chapel and those of a Priest who commented asking me to pray in particular for a seminarian's intentions. The Tradtiional Latin Mass at the Chapel of Reconciliation was packed out and a not particularly beautiful Church was beautified by a very reverent Holy Sacrifice of the Mass. Fr Bede's homily was particularly good, challenging us all, in our different states of life to seek holiness of life and the pursuit of perfection under the loving patronage and maternal protection of Our Blessed Lady. Fr Bede was always on hand for pilgrims to hear our Confessions and it is a great privilege to spend three days knowing that there is a chaplain on hand to offer you the generous and merciful compassion of Our Lord Jesus Christ in the Sacrament of Reconciliation. For three days, we were 'Mary's Army' and it is only fitting that an army should have a Chaplain for the 'soldiers of Christ'. Perhaps it is being part of such an 'army' that leaves one feeling a little blue afterwards - they say that many soldiers can't cope with civilian life after they leave their band of brothers - they become family. Anyway, after yet more walking we arrived at the Slipper Chapel joyfully and excusably triumphantly singing a hymn to Christ the King in Latin. It was quite a marvel to think that it was in such a manner that St Augustine of Canterbury and his Benedictine monks converted England. From the Slipper Chapel we had time, as I say, to pray before doing the Holy Mile to the original site of the Holy House of Nazareth in Walsingham, where prayers were poured forth for the Conversion of the land once known as England's dowry. I was pleasantly surprised, at the Voris talk, to have quite a few people coming up to me asking me, "Are you Laurence England?" and then telling me that they are avid readers of my blog. For someone who is largely unemployed, it was immensely rewarding (I won't say humbling) to be told that my blog and writing is appreciated by Catholics 'out there' in the real world. Often blogging can be a lonely pursuit, divorced from any sense of readership other than comments and stats and what with not working it gave a sense of real value to what I do on this blog. Real people read it! Some people on the pilgrimage read my blog too and by the time I got to Walsingham, while waiting outside the Gents toilets for someone (don't laugh) and was asked "Are you Laurence England?" by a lady with her son who was attending the TLM there, I assure you, it was no longer going to my head. I'm the weakling with the stick...lightweight! Many, many Rosaries, hymns and sacred litanies were sang along the way to Walsingham, all of which I pray touched Our Lady's Immaculate Heart, making reparation for our sins and the gratuitous offenses of England (yes, mine and the country's). Through her holy intercession, may this country find peace and salvation in God's One, Holy, Catholic and Apostolic Church. God willing, pilgrims, I will see you there next year. Book early. I would book early myself but somewhere between London and a curry house in Brighton I lost my wallet. Typical! "You Have Made Britain Sit Up and Think..."